We are all packed up and out of our Beijing place. Chris and Frankie flew off to the US of A last Wednesday, leaving me with an empty house and two suitcases. Beijing's emptyness creeped me out a bit, so I left as soon as I could. It will be two weeks before I actually land in Taipei, though. Work travels will take me to Hangzhou and Singapore first. It is hard to be without the ones you love most. Luckily, I am here now in Shanghai and hanging out with some of my friends. It is nice to stop back into my old life of dinner parties and glasses of wine, even if only for a few days. I do have two special friends to keep me company in Shanghai, where I am cat sitting for a friend. 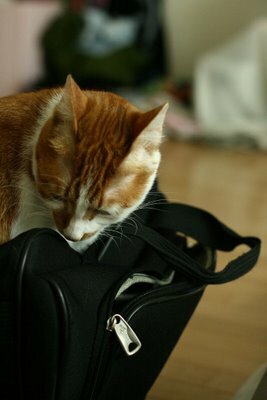 Finnegan climbed into one of my bags this morning as soon as I zipped it open. Thomas (not pictured) is sitting on my lap as I type. Cats are different from dogs, that much is clear. As I was about to leave the apartment this morning, I took one last look around for the kitties, but I could only find one. I spent 30 minutes searching for the second one (mischevious Thomas) in this little three bedroom place, but I never found him. It really freaked me out, and all day I was wondering how in the world I could have lost a cat in a locked apartment in under three hours. When I came back after running errands (thinking: please be there, please be there), he was sitting on the floor watching me open the door. A dog would never have done that, would never have hidden sneakily for 30 minutes as you frantically called out his name. Sheesh. I do appreciate the company, though. Frankie and Chris are far, far away. It is nice to have someone around to distract me from missing them. Instead of being sad about what I do not have (mei you), I should appreciate the love and company that I do have. I love that you have friends whereever you go, even if they are a little catty.